This book is sort of an “MSF Motorcycle Rider Course Light” for the general public. It contains material from both the Riding and Street Skills (basic) course and the Experienced Rider Course. 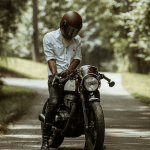 While this is good, basic information for the rider who hasn’t yet taken an MSF-sponsored course, it is mostly a repeat for those with MSF experience. Some of the illustrations are in color, and, as such, are better than those provided in MSF-sponsored training courses. But much of the book is devoted to an obscure discussion about how to divide traction forces amongst braking, turning and leaning; this discussion is also used in the MSF courses, and for some reason, it’s never really helped me to better understand the concept of tire traction. The bottom line is that tires only have so much traction to give, and if you’re braking, turning and/or sliding all at once, you’ve pretty much used it all up. In any case, although the book is a useful reference, it could use a lesson from David Hough’s “Proficient Motorcycling” (see the wBW review), which I believe is a much more useful guide for learning street skills, and should be in every motorcyclist’s library.